The weathermen were correct…a storm was predicted and came through for most of the night and the morning. The wind howled as the waves crashed against the shore until finally…pow…a transformer blew and the power was out! George has a gas stove though, so we still enjoyed blueberry pancakes, and I made the coffee just in time! The storm quieted around late morning. George and I walked out to the rocky shore where only a few days ago the ocean was calm, the sky was sunny, and the visibility reached for miles. What a transformation, the waves pounded the rocks as ocean spray rocketed into the air. The sky was so foggy, I could hardly see the islands just across the way. It wasn’t like the Banzai Pipeline in Hawaii, but I can imagine Thunder Hole in Acadia National Park was rumbling. I’m glad I had a travel day scheduled today, so I didn’t have to sightsee in this weather! Instead, it became a Cape Cod museum day. It took me about four hours to get to Sandwich, Massachusetts, the oldest settlement on Cape Cod and one of the Oldest in North America. Incorporated in 1639, “it later became the site of one of the largest glass factories in the nation”, according to Reader’s Digest. The first Cape Cod museum I visited the Sandwich Glass Museum which boasted a comprehensive display of cut, beveled, enameled, and blown glass. I focused most of my attention on three items: witch balls, a lighting display, and Josh Simpson’s glass galaxies. The witch balls are of interest to me because my mom collects them. The Boston & Sandwich Glass Company began making witch balls in 1826. 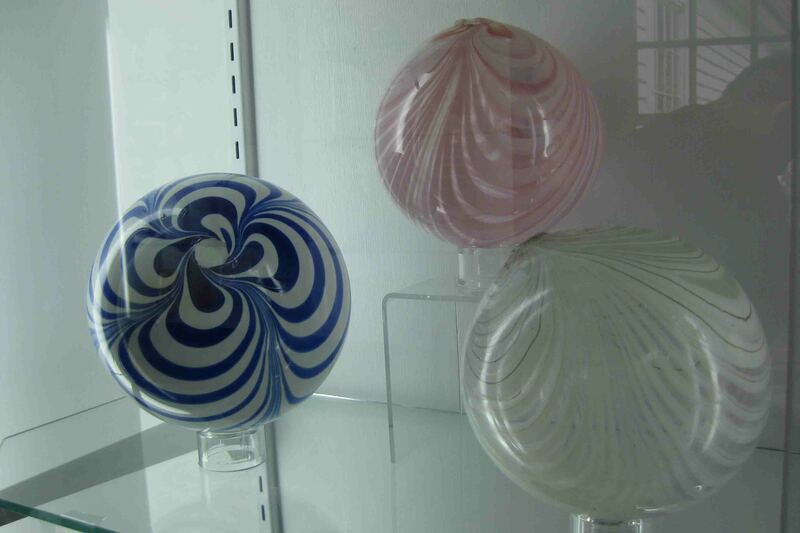 Because a hollow glass sphere is simple to make several glass companies throughout America and England produced them. Hung indoors, it was believed the balls beautiful colors attracted the witches who came inside, became confused and could not escape, thus the ball provided good energy to the household. Additionally, sometimes the balls were filled with herbs to ward off evil spirits. I found the lighting display interesting as it included a three minute demonstration of lighting progression in America… from candles, to whale oil lamps, to two burner lamps, to camsene (?) lamps, to kerosene lamps, to gas lamps, to the electric light bulb. I never really thought about how a lamp progressed over time or why they were shaped particular ways. Finally, one room in the museum was devoted to glass works by Josh Simpson. They were truly amazing. I don’t think I could really describe the techniques he uses to create his galaxies, but his globes appear three-dimensional inside an outer layer of glass. The planet looks textured with oil paint, yet it is different colors of glass and metal. One piece, pictured here, is only one of four made. I believe it took 15 attempts and nine months to complete. Neither my picture nor my explanation does this work justice. I have seen one of his glass blowing demonstrations. My next stop in Sandwich was the Thornton W. Burgess Museum. Thornton Burgess, once a resident of the town, is the author of Peter Cottontail. The original manuscripts and illustrations are displayed in the museum, a restored house that was built in 1756. Unfortunately, this Cape Cod museum was closed for the season, but it was right by a small pond, so I took the dogs for a brief stroll. This Cape Cod Museum was also closed, and I needed to get to Brewster no later than 5:45 anyway because my friend Page hooked me up with a place to stay!!! Her friends Eric and Lise, who have never met me, kindly lent me a room for the night. They had a previous engagement scheduled at 6, so I needed to at least meet them before they gave me the run of their home. Page knows Lise from a ski instructing clinic they completed together several years ago, and she introduced Lise to her now husband Eric. Lise teaches health and fitness at the local schoo,l and they were attending a function for the school’s Italy abroad program. Hopefully, I’ll get to talk to them a little longer in the morning. I tried to get to the house by 5:30 to leave a little time, but I took a small detour along the way so we made a brief introduction. The glass work by Josh Simpson is AMAZING. And beautiful. Of course, I love the witch balls. Wish I could add them to my collection! would love to see the Sandwich glass factory. Love new and old blown glass of all sorts. Must have been fascinating to see. love the pic of the shore with the spray, so pretty. One deff pic for the album is I think VT with the white church, it just looks like what I think of New England. I want to visit some day.